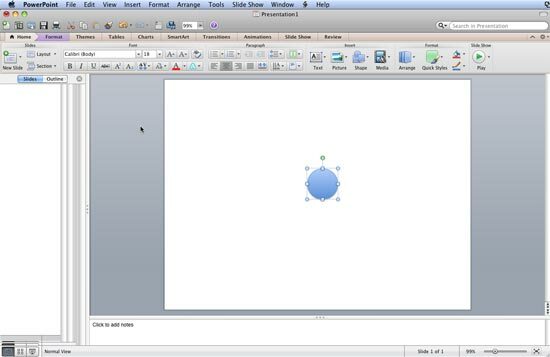 Learn how to draw a perfect circle in PowerPoint 2011 for Mac. Drawing shapes in PowerPoint is drop-dead easy with the vast repertoire of readymade shapes available in PowerPoint 2011 for Mac. You can easily insert these shapes with a click or two, but some tricks can help you take these shapes further -- in this tutorial, I'll show you how you can draw a perfect circle. Launch PowerPoint 2011. Most of the time, PowerPoint will open with a new slide in a presentation -- PowerPoint 2011 users can change the slide layout to Blank. Within the Home tab of the Ribbon, locate the Insert group and within this, click the Shape button to view the Shape gallery that you can see in Figure 1. 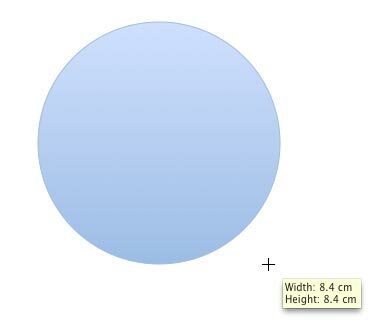 Select the Oval shape from the Basic Shapes since that's what we will use to draw a circle. Click anywhere on the slide to add the Oval shape in a predefined size (typically 1 inch x 1 inch), as shown in Figure 2. For resizing, hold down the Shift key while dragging any of the four corner handles to retain the circle proportion (preventing the circle from becoming an oval). Alternatively, click on the slide. Don't let go off the mouse yet -- instead, hold the Shift key while dragging to constrain the height and width proportions, as shown in Figure 3. Optionally, you can hold the Alt (Option) key (in addition to the Shift key) to draw a circle from the center.